It has been a while since my last blog post! Well it is time to correct that and share some exciting updates on Azure update and configuration management. One of the many benefits of the cloud and, often ignored is the fact that you get an opportunity to start over and take advantage of tools and services native to the cloud. An example is Update Management, Inventory and Change Tracking. Traditional on-premise tools used in this area can be costly and complex to implement in a cloud environment. Why not use the native tools? The general argument is that it is not mature enough or some other variation of it does not do what we need and we are used to our other tools. My suggestion is at least, try it! Understand its limitations but remember that everything moves very fast in the cloud “If you don’t go looking, you will never see it coming”. One area that I have been exploring is Update management. I have been designing and operating SCCM environments since the SMS 2003 days. I have also been testing the update management solution since its early incarnation as a solution in the Operations Management Suite (now Log Analytics). Now before you mention gaps, first explore and think about scenarios that fit what the current solution can deliver. In my opinion, there are multiple advantages over the traditional on-premise tools. My favourite features include, ease of enablement and exemption management. 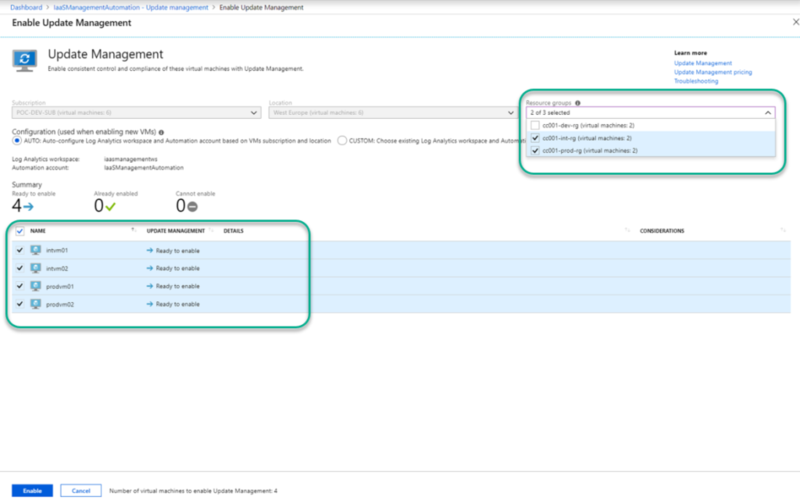 More recently the pre and post scripts have added another dimension to what you can do with native Azure Update management service (and it is Free*). This blog is focused on how to enable management and prepare to deploy updates to IaaS virtual machines. These can be windows or linux machines. I am approaching this blog with a zero to hero mindset. That is, I will be performing most of these steps using the Azure Portal. 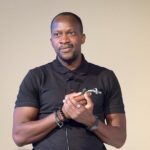 An Azure automation account is the core component for Configuration management and process automation and a whole lot more in Azure. 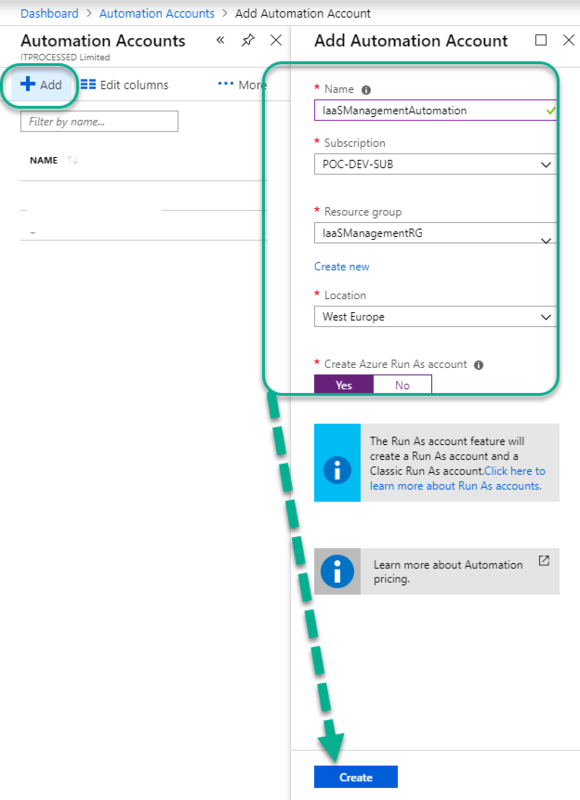 You can find out more about automation accounts at the following URL https://docs.microsoft.com/en-us/azure/automation/automation-intro . Dashboards in Azure help you to simplify your workspace in Azure. You can create multiple dashboards and even share it with other members of your team. I prefer to have a dashboard dedicated to updates management (Your personal customizable console). See this article on how to create dashboards in Azure for the steps. In my environment I created a dashboard called IaaS Management and Automation and pinned the automation account, the Log Analytics workspace and virtual machines. You can add additional short-cuts to suit your needs. We are now ready to enable Update Management. The steps we performed ensures that the automation account and log analytics workspace are created with appropriate names (your choice of naming). You can also enable update management from the virtual machine settings. I prefer not to use that approach because Azure creates the prerequisites (workspace and automation account) but you lose the flexibility to provide your preferred names for the automation account and workspace. Select the automation account you created earlier and navigate to the Update Management blade, verify that the right subscription is selected, select the workspace you created and click Enable. It takes few minutes to enable the service, once complete you are presented with the update management workspace (an example below). Click on the pin in the top corner to pin to your dashboard. This completes enabling the update management service in Azure. It is also recommended to enable Inventory and Change tracking as this option will compliment the update management service. Inventory and Change tracking is also enabled using the automation account. 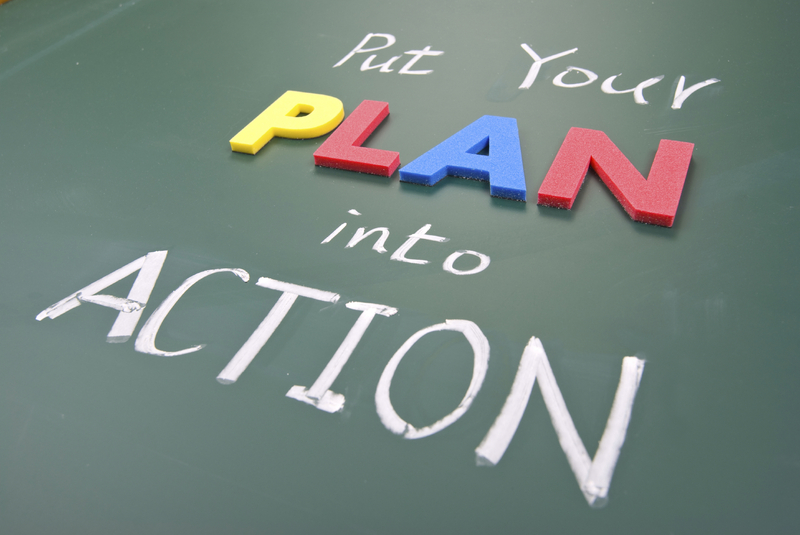 The steps for enabling Inventory and Change Tracking is similar to enabling Update Management. In the Automation account you created, navigate to Inventory under Configuration Management; click Enable to initiate the process. This will take a few minutes to complete. Enabling Inventory automatically enables Change Tracking. Conversely enabling Change Tracking will enable Inventory. As with most configurations in Azure, you have multiple options available to you when you need to perform steps. 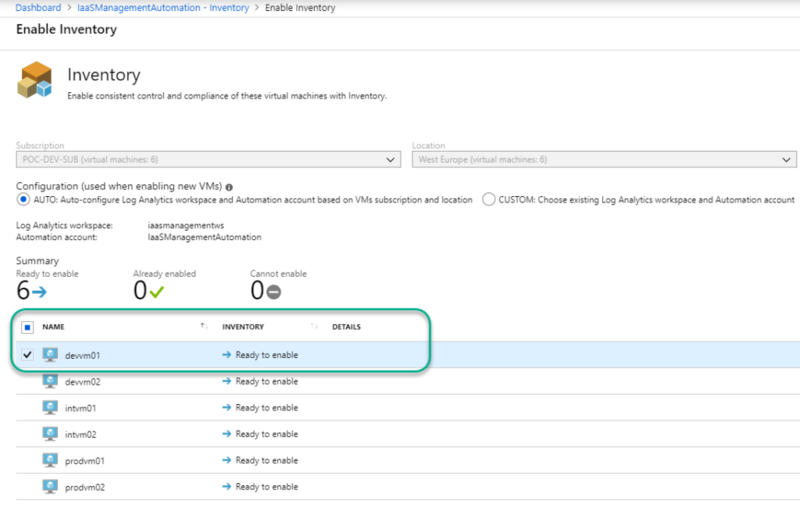 In order to see one of the options available to you when enabling Inventory, we will walk through enabling Inventory management for one Azure Virtual machine. This process can take up to 15 minutes to complete so be patient. The data can take up to 24 hours to show once the enablement is complete. The next step is to enable the update management agent on the machines in scope. 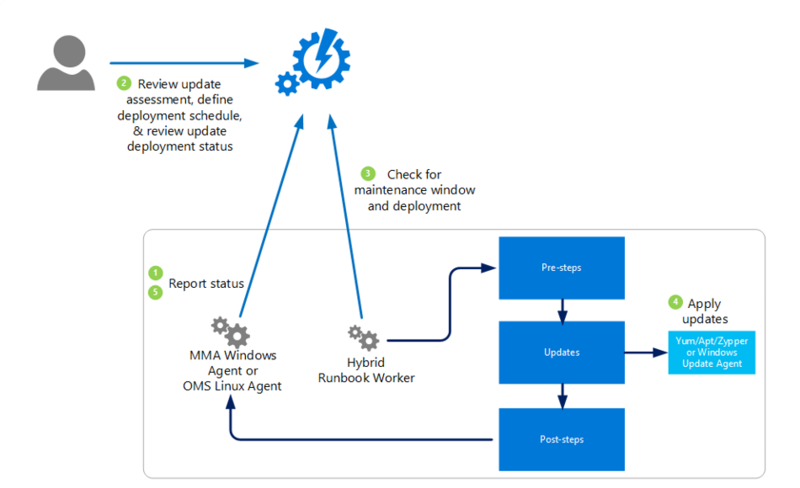 You can use the update management service to manage Azure virtual machines and on-premise physical and virtual machines. The operating system can be Windows or Linux. 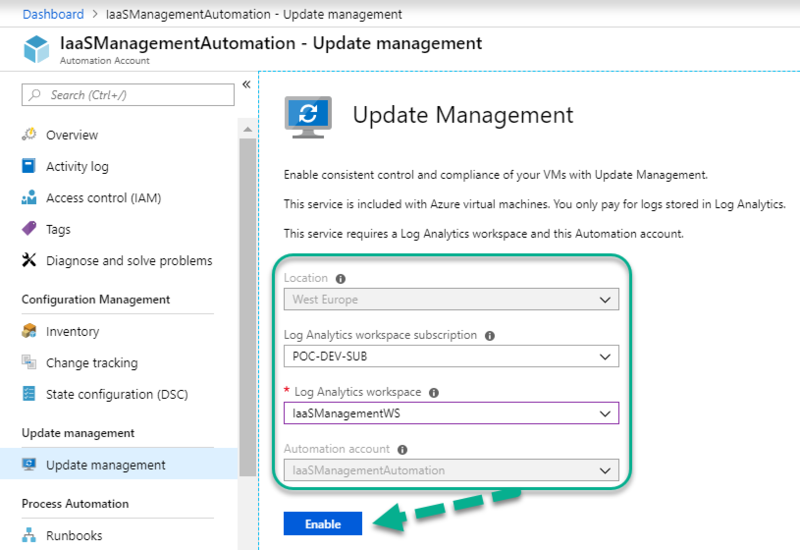 You can enable update management on Azure virtual machines either through the specific virtual machine properties or from the Update Management blade. If there are any machines that have Inventory enabled these will show up in the update management blade as a message to inform you that they are ready for management. Enable on all available and future machines: The available machines and any new machines added to the workspace will automatically be enabled. Select the first option and click enable. 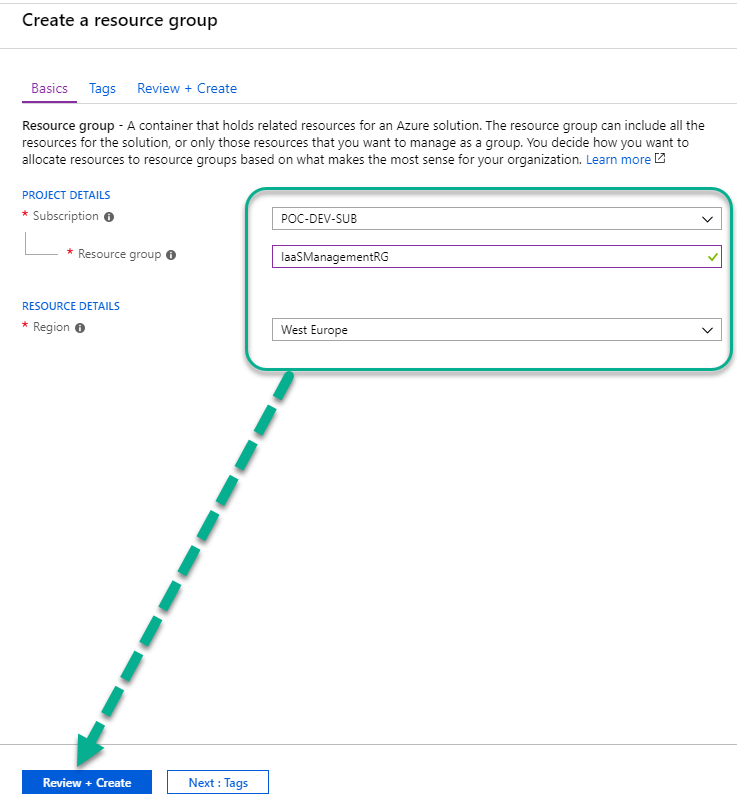 When you use this option ( + Add Azure VMs ), you see all VMs available by resource group. You can filter by unchecking one or more resource groups or by selecting individual VMs. Make your preferred selection and click Enable when done. The process can take up to 15 minutes or more so be patient (in fact go and have a break, you have earned it). Compliance data for the virtual machines or physical machines in update management can take up to 24 hours to show up in the Azure portal. During the initial assessment phase the compliance status will show as “not assessed” in the Azure portal. 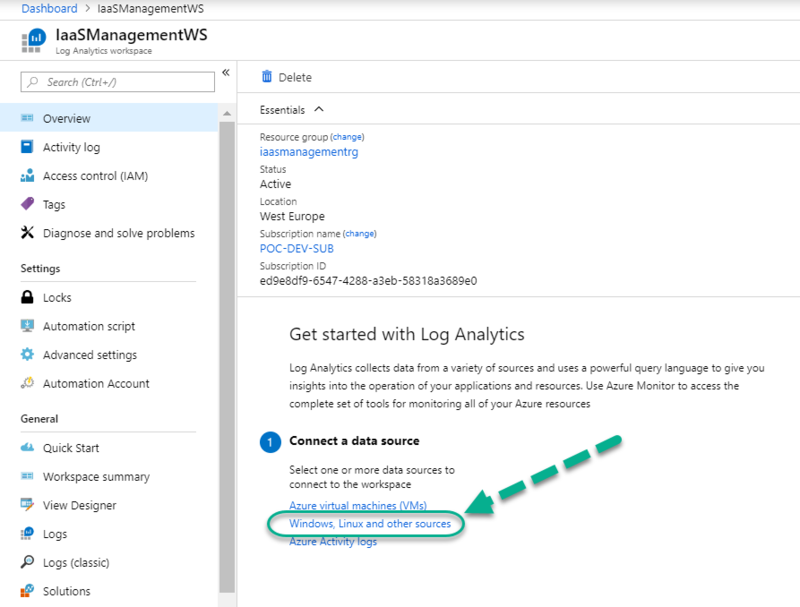 Navigating to the data source (download file) and workspace details has changed since Log Analytics moved into the Azure Portal. You will need to open the Log Analytics blade and navigate to Connect a data source and click the link Windows, Linux and other sources. In the Connected Sources, select the relevant source type to get the download and workspace details required to complete the installation and link to the work space. 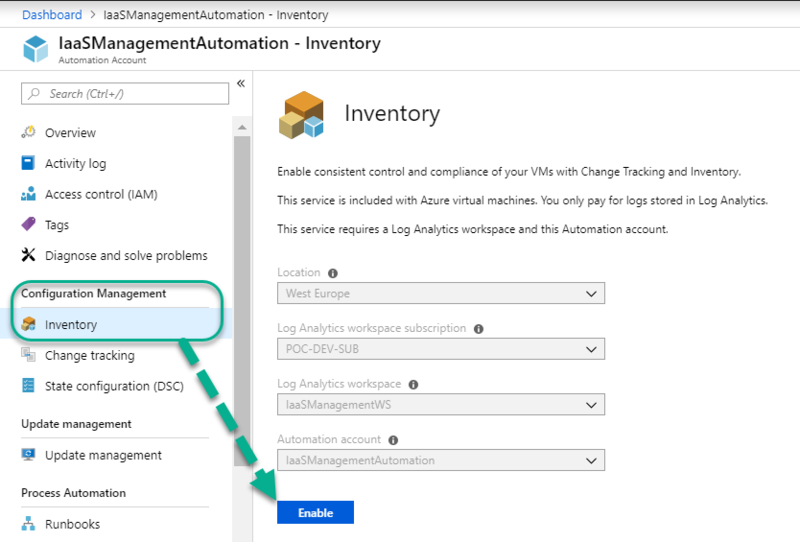 Once you install the Microsoft Monitoring Agent and apply the workspace details to a non-azure VM it is linked to the update management solution associated with that Log Analytics workspace. 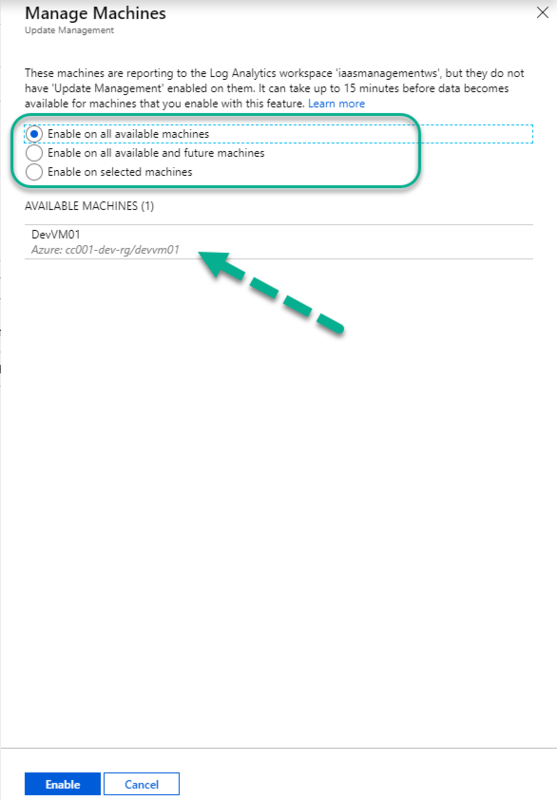 It is just a matter of waiting for the process to complete and the machines become visible and ready to manage using the same steps you followed to enable Azure VMs (Manage Machines | Enable on selected machines). You are now able to see all the machines including your non-azure machines with details of compliance states. Every 15 minutes, the Windows API is called to query for the last update time to determine if the status has changed. If so, a compliance scan starts. Scan runs every 3 hours. It can take 30 minutes to 6 hours for the dashboard to display updated data from managed computers. 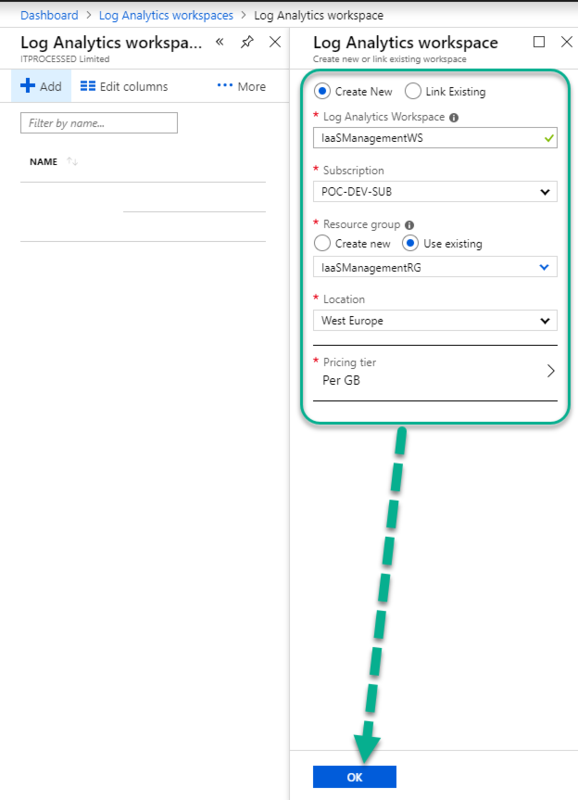 *You pay for log data stored in the Azure Log Analytics service. Detailed pricing. Enabling Azure Update management, Inventory and Change tracking is significantly simpler than tradition tools used for this purpose. 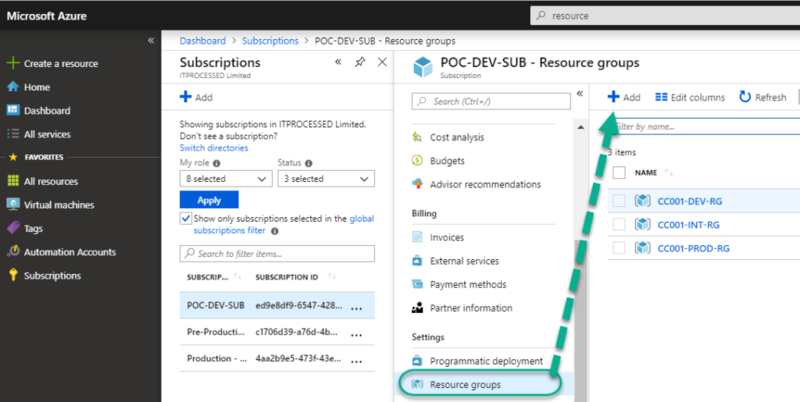 You can now assess and explore the scenarios and use cases for using this Azure service. Examples include but are not limited to reduction of infrastructure, workgroup machines and Linux machines. I will share how to setup deployments and update management scenarios in future blogs. In the meantime be an IT scientist and experiment (safely) to learn more about this valuable service.